Receipt Bank is simply bookkeeping rewritten for the 21st century, it is truly truly incredible. Throw out your bulging shoe box packed with endless chitties and welcome Receipt Bank into your new organised life. For a small monthly subscription, it takes hours and hours out of what used to be a burden for small business owners making the agony of manual data entry for costs and expenses a thing of the past. Not only that, it also means you don’t have to keep the paper records anymore, no storage, no filing, no printing and will pay for itself three-fold in this alone. It is absolutely effortless. Receipt Bank integrates beautifully as a typing middleman using your specific accounts codes and VAT rates. You can post through transactions directly to purchase ledger, spend money (card payments) from bank or add multiple cash paid receipts to an expense report to claim back from the company. As part of our bookkeeping service we will set and tweak the ‘Supplier Rules’ meaning that when Receipt Bank recognises one of your regular suppliers it will apply the set rules coding it automatically and claiming the correct amount of VAT. The auto-publish feature takes the rules one step further so that they are pushed automatically to Xero ready for payment for truly hands-free bookkeeping. Receipt Bank will also learn from your common expenses with predictive coding from previous transactions even if no supplier rules are set. Receipt Bank is made for the modern business life so you don’t have to set aside specific time to catch-up on admin. 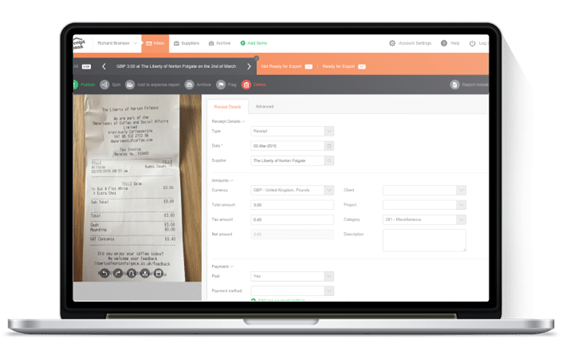 You can photo your receipts at home or on the go using the mobile/tablet app, forward PDF invoices or emails to your dedicated personal Receipt Bank address or drag & drop multiple files using the website. As an official Receipt Bank partner these are exclusive benefits to the numbercruncher customers meaning all your staff can enjoy unlimited paperless bookkeeping. Receipt Bank make such a positive impact to our customers lives that we now include it as standard in our accountancy packages. With $50 million round two investment secured in 2017 they are investing heavily for the future being recently selected as one of the UK’s “Future Fifty” technology companies.